I think the class that used all Asian themed designer papers was one of my favorites, I actually recreated this card at home with different papers. I don't remember what it looked like though. They got me... the germs... darn cold bugs. 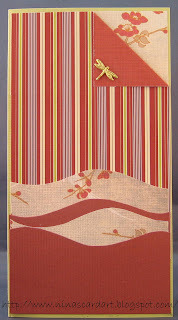 This card was from a class that used a series of Asian themed Designer papers, most of the cards from this class were very nice. I felt this card could used something else, a quote or saying or something. I don't mess with my samples though. This card portrait is not very good as it makes this card look of kilter. 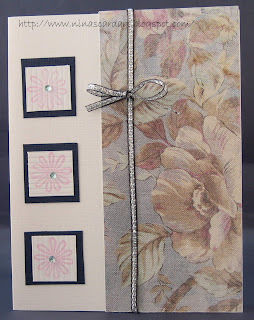 I like this card for its simplicity yet it still adds flash with the gems and thin silver ribbon. I think the germs are getting me. The boys are feeling better though. My son definitely had it worse then my husband but it is never good to feel sick no matter what the intensity. 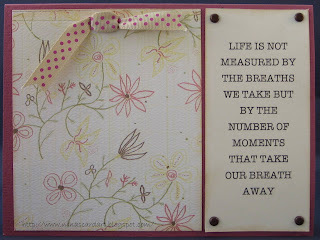 I love this card, I think it is one of my favorites from my classes. 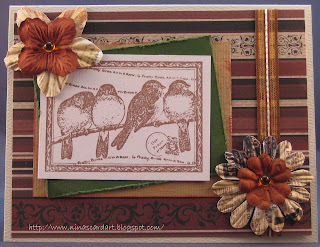 This card was done with distressed vintage papers, for most of these classes they were out of stock of the designer papers they used after the card classes. My boys are sick with this nasty cold going around. I can feel the little germs pointing at me saying "you are next". I only managed a half of a card this weekend and that is definitely not ready for a post. I did however watch two great demos at the local stamp store that got me thinking about a few of the card classes I took last year. So I have decided to pull them out of there hiding place and take some pictures. I don’t recall any of the supplies but some of the idea’s were great. I never give away any of the cards I make in workshops and classes so I have a box of them. I have only been up and about for 20 mins, I should be wide awake but I am yawning up a storm that cannot be good. Card #4, This project was suppose to be a scrapbook page however only half the workshop was interested in making a page so she adapted it to a card. I think she did a wonderful job. I saved attaching my butterfly till I got home as I wanted to 3D it with some pop-dots. The technique we were shown for this one was color variant on the stamps, a sponge was used to blend the edges of the ink before stamping. I love the butterfly with its swirls and text. Supplies: All Supplies are Stampin’ Up - Garden Green and handsome hunter cardstock, Simple Friendship stamp set, Patterns- Designer Paper, Pop Dots. 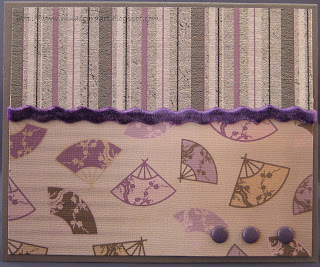 Card # 3, this card is an envelope type card, the inside recipe like card slides out. I was in a rush to take card portraits the other night so I forgot to take a picture of the inside card separate, I will do that this weekend and post again. I think this is a very cute idea for an invite, I might try one of these on my own. 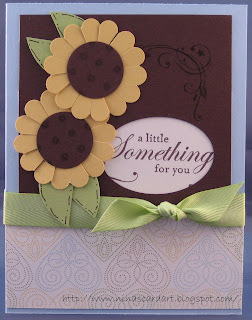 Supplies: All Supplies are Stampin’ Up - Sahara Sand, chocolate chip, very vanilla cardstock, To the Nines – Designer Paper, misc ribbon. I can feel Friday at my finger tips, it is almost here. 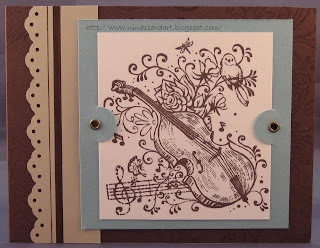 Card # 2 from Stampin’ Up Workshop. This image was colored and chose not to add color to my card at the time, I think I might use my watercolor pencils when I decide to add something. 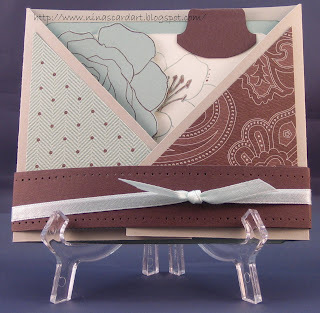 Supplies: All Supplies are Stampin’ Up - Chocolate Chip, Baha Breeze, Sahara Sand, Whisper White cardstock, Music Expressions and Symphony roller, eyelets. 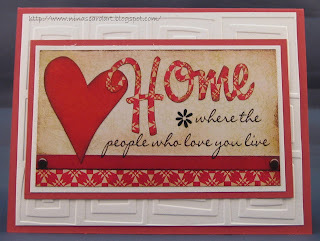 This past weekend I attended another Stampin’ Up workshop, over the next few days I will show you the results. 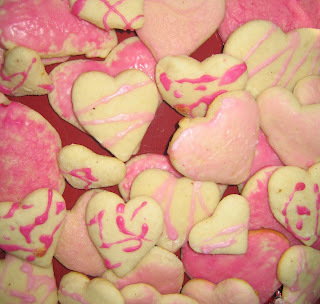 Happy Valentine’s Day… Are you a fan of this “holiday”? For me, this is a day of appreciation of the guys in my life (ohh that does not quite sounds right) I am referring to my husband and my son. For many it is a very commercialized day where everything is expensive. Flowers double or even triple in cost, it is near impossible to get a reservation to go out for dinner a week before, and for some it is a day that they feel left out such a shame really. I can give or take this “holiday” because I can love and appreciate my family every day. But…. I made cookies, more for my husband than for my son as he (he-being my husband) hoards them and maybe, just maybe he will share. These cookies are not friendly to make, actually that is not correct. They are easy enough to make just time consuming and for me a weee bit messy. 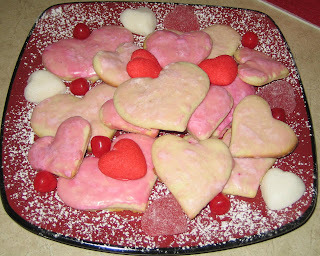 I won’t show you that, but here is a picture of the cookies. I also brought them little items like treats, books and magazines. I will make a nice big dinner, I am thinking steak with sautéed scallops and green onions, a salad and fresh veg. I will have time to make dessert it will be one of the Dr Oetker mousses (is that spelled right) but they are nice and light for after dinner (just don't think about the whip cream. Anyway, enough babbling and deep thinking, on with the card. I thought these little felt hearts were very cute, it is also nice that they are 3d with the double layer. 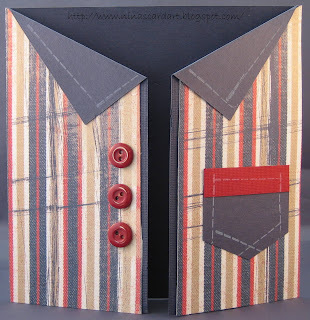 I layered the cardstock, and embossed the red cardstock to add texture. I used stickles for the center heart. I added the two little heart buttons at the end just because I thought it would look good. 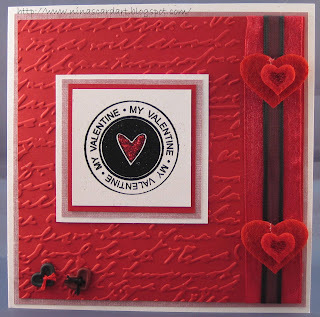 Supplies: Stampin’Up natural White Card stock, red misc cardstock, Designer paper –Memory Skor, Kolette Hall – My Valentine, misc ribbons, Made with Love – felt hearts, Jesse James – Heart buttons. Have a great day, I hope someone who loves you shows you a little appreciation. Shh he is just in the other room. Snoopy teenagers. I made a card, I made a card, I..made..a..card. Can you see me doing the happy dance. It is the most basic cards, and I cheated and used a big sticker… but I made a card. Another brutally busy week at work and I have been so tired by the time I get home that my poor craft supplies get ignored as chores and family come first. I had to make this card though… duh Nina it is Valentines tomorrow. It is the weekend, I am done work for the day. I have friends, family and house work ahead, maybe even a Stampin’ Up Workshop but no work type work. Supplies: Stampin’ Up red and natural white cardstock, Bo Bunny Sticker… umm yeah that’s it. Really does it need more, me thinks not. 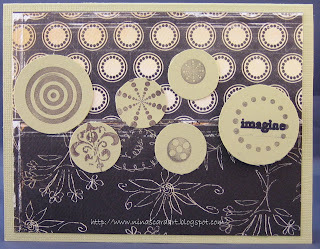 I used my Cuttlebug to emboss the first white cardstock layer for texture. I think this is the cutest little stamp, it called out to my water color pencils. After I took this card portrait I added some Diamond glaze to the daisy to make it glossy looking. The second layer purple designer paper is embossed with Cuttlebug Divine Swirl, the way I took this picture is make the card look slightly off balance when really it is fine. Supplies: Lime and off white cardstock, Designer papers – Costco slab (unknown company),Elzybells Art Stamps – Daisy Canopy, Offray Nice and Narrow ribbon, Prima Flowers, Misc green gems. Busy Busy Busy, need I say more. 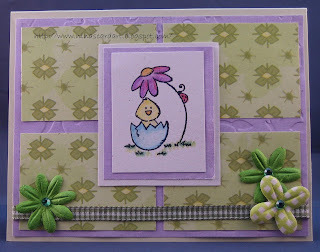 I love this stamp, I found it when I was on the hunt for something cute for Easter. I really like how Versafine ink shows all the details with this stamp. Supplies: Textured cream cardstock, hunter green cardstock, beige mulberry, Designer paper – Darkroom door – Rialto, Magenta – 4 birds, Prima Flowers, Misc ribbon,K & Company adhesive gems. TGIF, I worked some OT last weekend and with this week being beyond busy I am sooo looking forward to not having that morning meeting with my alarm clock for a couple of days. Wow, for such a basic looking Valentine’s day card there sure is a lot of supplies used to make this card. 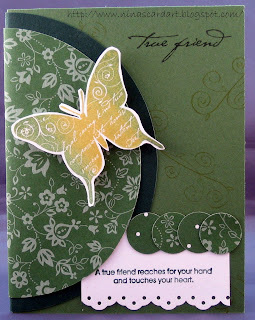 The first step was to actually build the card around the Cuttlebug Floral Fantasy embossing folder. I also tried about 4 different stamped hearts with this embossing powder, I was so happy with the result.. who would have thunk it, Christmas embossing powder… Fabulous. This portrait does nothing to display how pretty and sparkly it really is. The rest of the card just sort of came together, the ribbon is in one of the many bags of salvaged ribbon I have in a little drawer. The Happy Valentine’s Day stamp is one of those $1.50 ones from Michaels. I have a ton of those from all ‘holidays’ you never know when one might come in handy. I filled in the little heart with Ranger Stickles, my sweet husband brought out the local stamp store at Christmas and I have to make my way through my new Stickles collection. 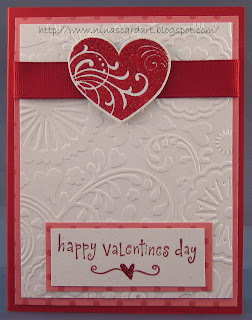 Supplies: Red cardstock, Natural white cardstock – Stampin’ Up Designer paper- K&Company, Misc ribbon, Inkadinkado clear stamps – Hearts, Katie & Co – Happy Valentines Day, Ranger red tinsel embossing powder. Ranger xmas red Stickles. Time to pay the music man, for guitar lessons that is. A very basic but fun card to give my son's music teacher. Yes I am still making a new card every month, it is fun and challenging to make a music themed card every month. This time the black rawhide type strip reminded me of a leather vest a musician in a rock band might wear, or even a guitar strap. 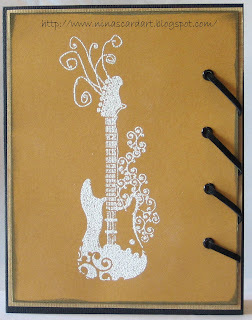 Supplies: Black Bazzill cardstock, Black/Gold mulberry paper –unknown, black eyelets, black leather strip, Inkadinkado Rock Star Clear Stamps. This card was a quick made and I really did not feel like setting up the light tent so I improvised so there is a slight shadow but over all this portrait turned out well. Happy Anniversary Barb and Miles, enjoy today *smile*. What can I say I am a woman of few words. Hugs to you both. 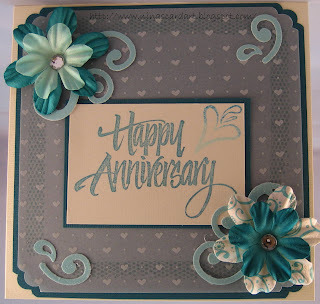 Supplies: Cream and turquoise Bazzell, turquoise glitter paper - The Glitter Stack, Hearts Vellum – The Paper Company, Studio G- Heart Clear Stamp, All Night Media – Happy Anniversary, Prima Mulberry Paper Flowers, Sizzix – Scribble swirls, misc gems. I mentioned earlier in my Jan 31st post about my Vellum experience, the card above was my first attempt. I was not happy with the way the adhesive worked out (I do like the card though) I had hoped with the dot liner type of adhesive that it would not be as visible…. Not. Of course I had put adhesive on all 4 sides before applying it to cardstock and it looked fine till that point. I could not just garbage the whole thing*sigh* . If I did not use the cards I learn with, I would still be frequenting Hallmark. Thank you sis for not tossing the card right back at me, it was made with love and that counts for everything. It is a pretty card. My sister Barb is the girly girl between the two of us, I am not one to get excited about cloths and make-up (I think I am repeating myself). However I have found that I like pretty stamps… go figure. This card is a bright cheery card, I wanted to make a card so bad last evening but I did not have a focus so I made a focus. This card will be for a co-worker of my husband who I know has a birthday coming up in the next few months and before he can pull a short order request out of his pocket I already have a card that I can tuck away. This card portrait misses a few key focal points, the dress and shoe are both sparkly a nice elegant sparkle, where as the second layer is a heavy glitter paper. I chose yellow because I wanted to use the yellow flowers, they come together in their little container with the turquoise one so why not card ‘em that way. I stamped on the off white with small specks cardstock from Stampin’ Up as I find it a little less hard then a full on white cardstock. 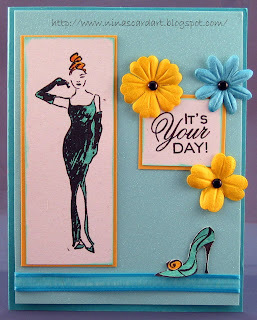 Supplies: Turquoise and yellow cardstock, Natuals white – Stampin’up, Designer paper – The glitter stack, Stamp-it – Audrey-esq, Inkadinkado – Shoe, Impression Obsession – It’s your day, Straight and narrow ribbon, Misc brads, Misc flowers. 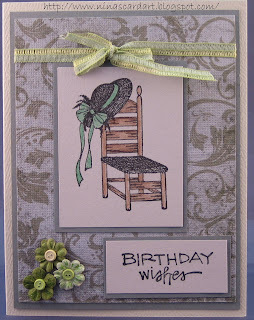 This is a very simple card, I wanted to color something with my water color pencils and I have also been wanting to use this stamp with the hat and chair since I brought it but not sure for what. This ribbon is actually shimmery and reminds me of a nice floppy ribbon that would look lovely on a hat, I uses my Paper Craft atyouSpica glitter markers to add a little sparkle to the flowers. Supplies: Cream textured and gray/green cardstock, Designer Paper - , Great impressions – Chair and Hat, Kolette Hall – Birthday Presents, Misc ribbon, brads, Prima Flowers – Got Flowers Deux. I was pretty busy last week at home and work, I earned a little OT which is nice. I however have not done much in the way of cards and the cards I have portraits of I need to wait for special and significant days to post *smile*. Maybe some more Vogue Tales or should I say tails to share.